Although two couples were in jeopardy at the end of the show -- model and Cover Girl Alexis Ren and her professional partner Alan Bersten as well as pro football player DeMarcus Ware and partner Lindsay Arnold -- no one was sent packing during this fifth week of competition. According to Dancing with the Stars co-host Erin Andrews, home viewers votes from last week and Monday night will carry over into next week and, when combined with the judges' scores, will result in a couple's ouster. "Disney Night" featured each couple being transformed into some of their favorite Disney characters and dancing to songs from beloved Disney films throughout the years. Two celebrities topped the judges' leaderboard and tied for first place with 29 out of 30 points from Dancing with the Stars judges Carrie Ann Inaba, Len Goodman and Bruno Tonioli. The celebrities were Alexis and Juan Pablo Di Pace, an actor and Fuller House star. Alexis and Alan danced the foxtrot to "Just Around the Riverbend" from Pocahontas. Bruno called the routine "exquisitely lyrical," as if their "two hearts were beating as one." Carrie Ann said the way Alexis danced made her believe in fairy tales. Juan Pablo and partner Cheryl Burke performed the Viennese waltz to "Gaston" from Beauty and the Beast. 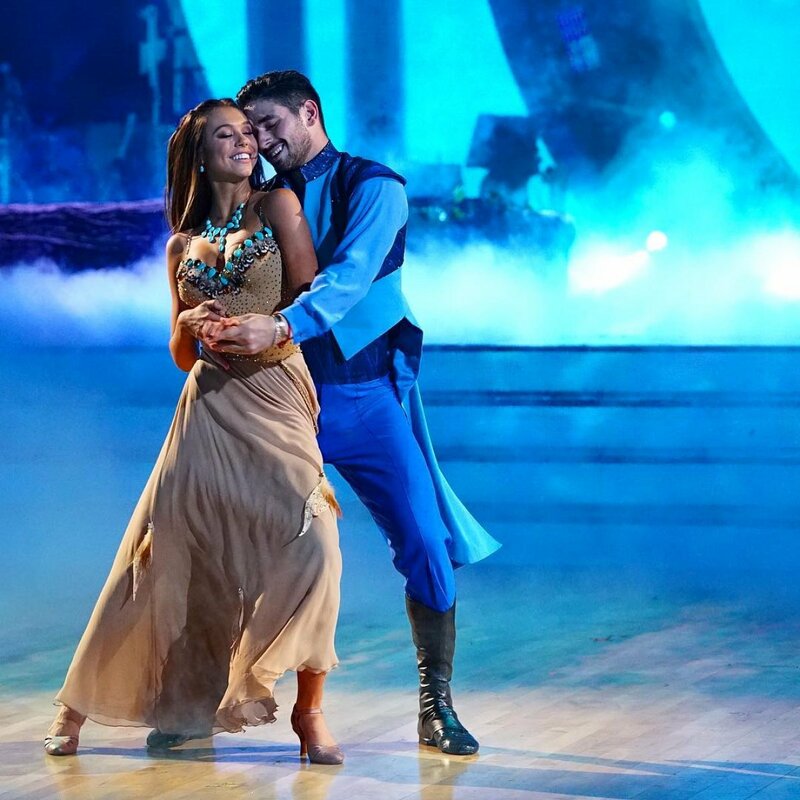 Carrie Ann said every detail was perfect and Juan Pablo was "spectacular," while Len noted he was "fantastic." Singer and dancer Milo Manheim and partner Witney Carson finished in third place on the judges' leaderboard with 27 judges' points after taking the stage with a quickstep routine to "Incredits 2" from The Incredibles 2. Fourth place belonged to DeMarcus and Lindsay Arnold, who earned 26 points for their Charleston routine set to the music of "A Star is Born" from Hercules. Mary Lou Retton, a former Olympic gymnast with five medals, and partner Sasha Farber claimed fifth place on the leaderboard with 25 points. The couple danced a contemporary routine to "Reflection" from Mulan. Sixth place represented a tie between two couples at 24 points on the leaderboard. Harry Potter star Evanna Lynch and partner Keo Motsepe performed a 24-point worthy jazz routine to "When Will My Life Begin?" from Tangled. And actor and country music singer John Schneider and partner Emma Slater took the stage with a quickstep routine to "I Wan'na Be Like You" from The Jungle Book that earned the same number of points. Country music radio personality Bobby Bones and partner Sharna Burgess placed eighth on the leaderboard at 21 points after dancing a waltz routine to "Part of Your World" from The Little Mermaid. And finally, Bachelor in Paradise star Joe Amabile and partner Jenna Johnson remained in last place on the leaderboard. The couple received only 17 points for their jive routine, which was set to "Zero" from Ralph Breaks the Internet.